Last Sunday, my five-year-old and I had the opportunity to spend the afternoon together, just the two of us, at a local indoor pool. With a younger sibling at home and a full day at school, time spent one-on-one has been rare this year. I’ve missed her. My girl has a prolific imagination and spends most of her unoccupied time making up or enacting stories. As she has been learning so many new things this year, I have had the gratifying pleasure to observe how she weaves the new facts and ideas percolating in her brain into her stories and play. So when we packed up go to the pool, I was interested to see her stash three princess figurines, three plastic cupcakes and a baby doll into her toy bag. I never really know where she will go with things. When we got to the swim center, she headed straight for the baby pool, where she began setting up a scene. First, she brought out the three princesses and lined them up along the side of the pool. She placed a plastic cupcake in front of each. Then she went to her bag and brought out her baby. 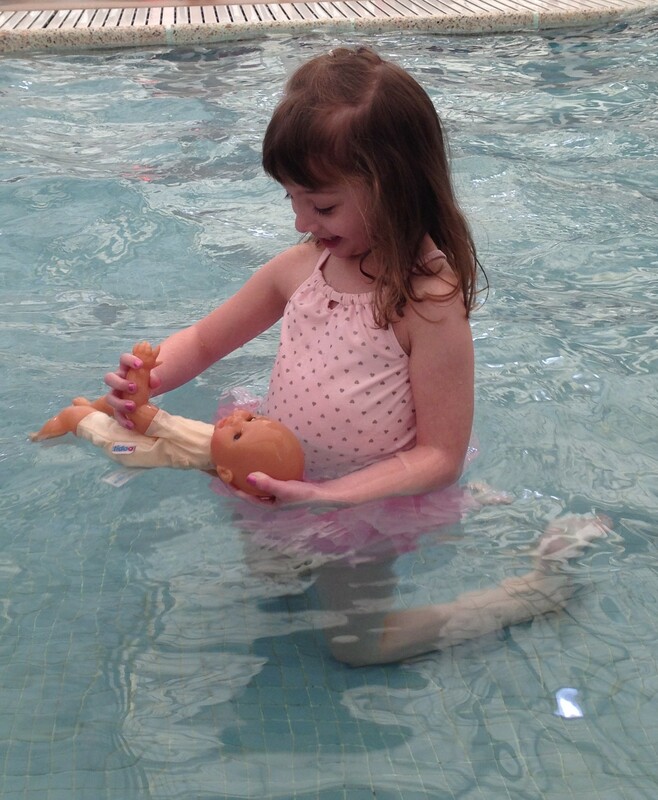 She carefully cradled it in her arm and carried it into the pool. And then she baptized that baby, in the name of the Father, and the Son, and the Holy Spirit, Amen, using water consecrated with chlorine and the contents of a half-dozen swim diapers. When I asked her about it, she explained to me that she had learned about baptism in her religious education class that morning. She told me that baptism is how we become a part of God’s family. And because she loves her baby doll, she wants her to become a part of our family. Therefore, a baptism was clearly in order. It was an achingly sweet moment, the kind that reminds parents that bringing their child into the world really was the best thing they have ever done. It made me proud of her. It also made me reflect on and appreciate the best thing children do for us — allowing us grown ups to witness the fertility of their minds and the largess of their imaginations. Most of us recognize the story from the Gospel of Luke, when Jesus urges his disciples to bring the children to him, because “the kingdom of heaven belongs to such as these.” It is a story that tends to be linked to the idea that what is most valuable in children is their innocence and unworldliness. It seems to imply that children, in their dearth of experience, are better able to absorb the teachings of faith, and indeed of the world around them. I don’t believe that this is a strictly religious way of thinking. There is a common tendency to think of children as blank slates waiting to be written upon. Children are certainly unworldly. There is necessarily an innocence to the way they approach their world. They have no basis of comparison. They have no prejudice. Their minds are open. They are open, but I don’t think they are waiting, passively, for us to shape them. If I have learned anything about children and the way they approach life, it is that they do so through constant questioning and experimenting. They are endlessly pushing the boundaries of their universe. And these attributes apply equally to the way they understand faith and the way they process new facts. When I think of my daughter, who is at that perfectly ripe age when the concepts of faith and fact are just coming within her intellectual grasp, I see nothing passive about her approach to the world. All I see is activity – a dynamic, unrestrained pursuit for more knowledge, a constant pushing and stretching of the limits of her understanding. I hear her asking why, and no matter how thorough an answer I give, I hear her asking why again. I see her acting out, and re-enacting, what she is learning so that, through interpretation and experience, it becomes a part of who she is. When I think of the idea that “the kingdom of heaven belongs to such as these,” I don’t see it as a calling to submissiveness or innocence. I see it as a calling for us to approach faith — and reason — like children do – with flexibility, enthusiasm, ceaseless questioning, and a mind with ever-expanding boundaries. Those are the best things that children have to offer the world, and we adults should not forget that. After my daughter finished her charming baptism by pool water, as I was thinking about the profundity of what her mind, and the minds of all children like her, will bring to our future, she reminded me of something else. She tossed her baby to the side of the pool and, splashing, shouted, “Mommy, that boy FARTED! He made BUBBLES in the WATER!” While I blushed and suppressed my silent laughter, I reflected on the next best thing children have to offer the world: their uninhibited appreciation for bathroom humor. Life is best lived with curiosity, questioning, a mind without boundaries, and the ability to laugh at our bodily functions. This story shows me the power of a teacher. God bless them, every one.